You never know what you're going to find on eBay. The auction house of the interwebs routinely plays host to metal both obscure and unique – two categories the vehicle you see above satisfies without question. It's a 1964 Pontiac XP833 Banshee Concept, and while it's easy to think that the car is little more than a warmed over Corvette design, the truth is that this particular Poncho had widespread influence on General Motors design language for more than a decade. Originally penned by none other than John Delorean, the Banshee was supposed to be a more sports-oriented competitor to the recently introduced Ford Mustang. Unfortunately, when the concept was completed, the higher-ups felt that the Banshee would threaten the Corvette throne and the project was scrapped. It's a song that would be repeated time and time again in the future. Pieces of the Banshee design would live on in cars like the C4 Corvette and Pontiac Firebird, but the actual concepts themselves were slated for destruction. Fortunately, the studies were boxed up in shipping crates and tucked away for safe keeping, eventually sold to the GM execs who had taken part in the Banshee project. This particular example has a mere 1,500 miles on the clock and sits in its original condition. It can be yours for the right price, but with almost $50,000 on the auction and the reserve not met, it ain't gonna be cheap. I love this car! I never understood why GM didn't go through with it. Make a cheaper Vette? There's plenty of ways they could have created this to not challenge the Vette's Throne but to BETTER it! Just like the whole Firebird Vs Camaro thing. SWEET! I never thought I'd say this but I like that almost better than the older vettes. Even with an I6, I can still hear the potential bitching of Corvette owners. The Buick GN turbo V6 would of been a great heart for it. Even today, the LLT motor would have been beast in a chassis like that. 312HP from a DOHC N/A V6. This is one of two XP833 Banshee concepts. The other was a convertible with a V8. The second one seems to be lost in time. Rumor has it that it might have seen the crusher. No one is very certain. This was never green lighted for one vary obvious reason, it would have been a competitor to the Vette, which is an unwritten GM no-no..."Thou shall not beat (or compete with) Corvette". That is also why when the '87 Bucik Grand National GNX cars were built, they were faster than the Vette and the GM brass had a fit over it. 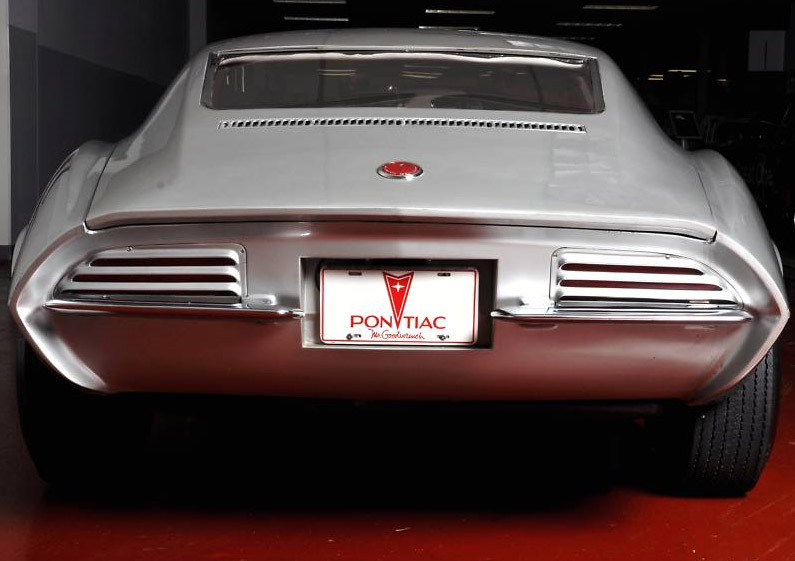 Buick officials were chatised by GM but got away with it since it was limited to 500 cars (547 were actually built) and the GN and the entire rear-wheel drive A body was going away the next year. So this was a swan song. So after that incident, Buick employees (without GM sanctioning) had bumper stickers made up with the Turbo V6 logo that said "I Brake for Corvettes". To this day, with the possible exception of the now defunct Cadillac XLR & XLR-V, no one competes with Corvette within GM. It is still the fastest production car GM produces globally. The XLR was just the most expensive. Very interesting! I can see why they wouldn't want to BUT you would think they could come up with a way that not only keeps the Vette on top but makes it more prestigious. Then I can understand that the Vette has always been like this, it would hard to change now but back then might have had a chance. I think this is what GM attempted to do with the XLR in the first place. The XLR was not faster than the Vette, it still had the beefed up Northstar V8. The XLR-V had the supercharged Northstar. Still neither version of the XLR was faster than the Corvette's top of the line motors. So Corvette stayed on top for that reason. Let's not forget that the XLR came as a desire to make Cadillac both a premiem luxury car and world-class performance car. So there was a real need for a high-end performance car. So the XLR became the Halo car for Cadillac. So you have to ask yourself, why would I buy an XLR - especially given the sticker price and the Vette is still faster? Other than to say "I own a Cadillac badged Vette", I struggle to come up with a reason. I suspect that this was one of the key reasons why it didn't sell very well. Very valid point but I think the wrong direction with the XLR was using it as a Cadillac model, thus its price was going to be higher. My theory with the Banshee was to make it a little more affordable but as powerful. The catch is don't make it AS luxurious or keep a good chunk of stuff towards the Vette end so it does maintain its prestigious appeal. Could definitely be done more easily now-a-days with all the options available on cars but it would be harder to do because GM, and even us, have that don't mess with the Corvette attitude as you said. Its one of those things that would be interesting to see but never going to happen. I personally would love to of seen a version of Corvette ZR1 Vs. Banshee ZR1. I've always thought competition, even within your own brand, will bring the best out in technology because it turns kind of personal lol. I think using a different brand name like Pontiac, Buick, Saturn or Olds for a Vette companion car would appear to diminish the Corvette image. If (say) Pontiac can sell a Banshee Vette for $10k less than a comparable Vette, why would I consider buying a Vette at all? And if Pontiac can sell it for $10k less, why can't Chevrolet do the same thing with the Vette? After all, Chevrolet is suppose to be the entry level brand and Pontiac is suppose to be the performance brand. So you should expect to pay more for the Pontiac Banshee than the Corvette. While in a lot of cases, competition is a good thing, internal competion to the Vette could be disastrous in my opinion. Also one thing we didn't mention about the original Banshee concept is how powerful and influental Chevy exceutives were at GM at the time. They successfully lobby against the Banshee and I can imagine that there was some arguing over the XLR too. Couple things on what you said, don't take these as insults or anything but this is just what I think and to get everyone to think about this whole "Corvette Image" thing. I wouldn't describe Chevrolet as the "low level" or "entry level" but yes they are no Cadillac but with that said if another brand took on the Corvette type nameplate, why would it diminish the Corvette name? If Chevy is the "low level" brand then if moving it to a "higher level" brand should then differentiate it as higher class. Or vice versa with a lower class. Each would have its own feel but would be different and have some where to compete with the Corvette. On why to buy a Corvette vs. the cheaper Banshee, I refer you to Camaro Vs Trans Am. The Firebird Trans Am was just a bit cheaper than a Camaro yet still had pretty much the same parts in them, just design and branding were different. Yet I still think the Camaro was more popular than the Trans Am (even though I love Trans Ams, I was first in love with Camaros). This whole thing of having the Banshee to me would be the same as the Camaro Vs. Trans Am and is why I have the idea . If GM never did it then I would be able to follow the Corvette image probably easier. No insult taken. You make an interesting point Ringo. I will answer the question of the Chevrolet as the entry level brand first. Some histroy is needed. When Alfred P. Sloan was the GM President and CEO, he felt that GM had enough car brands that there was a car for every wallet. So he aligned the brands with pricing accordingly. The idea being that you would buy a different, more luxious brand as you got older and could afford a more luxious (and pretigous) car. Chevrolet was the entry level brand (and a car for every purpose), then Pontiac, Oldsmobile, Buick, and Cadillac in that order. GM tried to make GEO and then Saturn the entry point but that failed. Today, it is still Chevrolet, Buick, and Cadillac. So Chevrolet is still the entry point and still has vehicle for every purpose. Chevrolet still outsells all other GM brands combined nationally by a wide margin. It was that way in the glory days of the muscle car too. That is why Chevy execs have so much pull on GM. The fact that Chevrolet has the Corvette is good and bad. On the good side, the Vette represents a halo car for Chevy but it also the de facto halo car for the corporation as a whole. It exemplifies all the latest modern performance technology. It is the showcase for GM performance. Several other concept cars based on the early 50s Corvettes by Buick and Oldsmobile never saw production either. The Buick Wildcat II comes to mind for example. It is bad because of the positioning of the rest of Chevrolet as the entry point has made the GM brass reluctant to allow a company competitor to the Vette. Why would you compete with your own corporate halo car? It is like Chrysler building a competitor to the Viper....why would you do it? Now comparing a Vette competitor vs the Camaro/Trans Am/F-body has some problems. First of all is the production. Vette production is low - about 50-60k units a year. F-body is about 200-300k units a year when both cars were produced. So volume is a problem. The Bowling Green plant is only geared for the level of production. You could argue that the XLR line could be converted to add some level of production - which is true. Still the XLR was limited production too. So let's say that about 100k units can be produced in Bowling Green. The Owshawa plant is producing over 100k Camaros (V6s and V8s combined) alone. I can see production increasing to over 150k units - espeacially once the convertible and a rumored Z28 comes out. Next is the market for Camaro/Trans Am vs the Vette class cars. Camaro and Trans Ams are aimed at young people. It is what I call "affordable performance cars" for the 20-30 something year olds. It is less than $40k for a new Camaro (which I personally think is still too expensive - but that is me). So the average college grad can afford a new Camaro or TA. The last point I want to make here is that the Camaro and Trans Am are seen as daily drivers, cars that you woudl drive day and night, all year long, especially in the winter. A comarable Trans Am should sticker out for slightly more than a similar equiped Camaro too. The Corvette is the ultimate showcase of technology and performance for GM, so price and target age is not a consideration. The Corvette essentially sells itself because of what it is and it's performance benchmarks. So pricing is based on low production numbers, which drives the price up. Therefore only those people with much deeper wallets or 401k plans can afford them. Lets face it too, you don't normally think of a Corvette as daily driver either. I seldom see Corvettes on the winter roads here in Michigan as an example. So those people that own a new Corvette can probably afford a new Buick or Cadillac as well. I am not saying that a Vette competitor is not possible, but I don't think GM is going to sanction it anytime soon. I think the XLR is a once in a lifetime event. I doubt that GM will be doing that again unless another Bob Lutz comes along. Anywho I don't really have much to add, I really think it could be done but do I think we'll see it? That's another question all together and I firmly believe everything you say Frosty, GM will never do this in a large scale. The last thing I have to say on this topic - which I have found very enjoyable - is Vette pricing. Let's face it, since the Vette has the premiere technology in it, that technology comes with high price. Being lead adopters of new technology is always more expensive than waiting awhile and letting prices come down as demand goes up. So designing a new Vette will always be more expensive than a new Camaro or Impala. That is not to say that this cars won't have innovative features too. However, you won't find carbon fiber front ends, 6-piston brake calipers, Z or high rated tires, supercharged LS9 engines under the hood of these cars either. These cars don't typically warrant that level of technology or sophistication. Furthermore, the Camaro and Impala typically are high production numbers. So they have a different break-even point than the Vette. Selling 60K units for the Vette vs. 120k Camaros is a whole different price point. So even if the cost of the developing either car was the same, you can spread your costs out further on the Camaro or Impala. Profit margin is another thing to consider. GM's profit margin must be close to 50% (or more) on the Vette, while I would expect the margin on a Camaro or Impala to be quite a bit lower. Vette pricing is then based on high cost plus high profit margin and divided by low volume numbers. So pricing for the average joe is simply out of the question. It is clearly intended to be an elitist supercar - pure and simple. It has become America's Supercar - no offense to the Viper or Ford GT fans but let's face facts - the Vette has been around a lot longer than either of these halo cars from Detroit, plus they are now both out of production! So the Vette lives on. Reputation is another thing. You generally don't see TV commercials for Corvettes - you might see a Corvette in the background for another Chevy or GM product. You will see ads for Camaros and Impalas - especially if there are new styling designs for these cars. So Corvettes reputation alone will help sell the cars themselves, while the daily drivers need some encouragment via advertising from time to time. 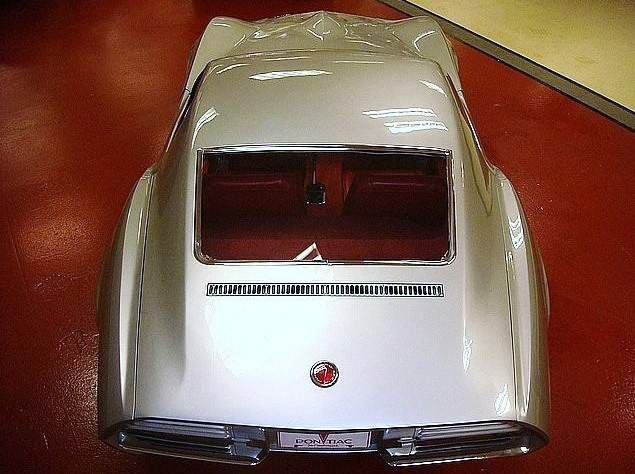 what chassis was this based on, was it built off the corvette frame or totally unique? The Banshee was based on the Corvette chassis of the day. The XLR is based on the C6 chassis. The 3rd generation Corvette was already on the drawing boards, and the Banshee borrowed styling cues from that car. A couple of things that distinguished the Banshee from the Corvette was that the Banshee used a solid rear axle (to keep costs down, and make the car more affordable than the Corvette), and a unique clamshell door design. This was John Delorean’s pet project, and he really wanted it in production. Two functional cars were produced (built by an outside coach builder). One was a 6 cylinder engine, the other had a V8. One was a hardtop, the other a roadster. There was even a 4 passenger version that was proposed. But GM wasn’t interested in eroding the Corvette’s market share, and the top dogs nixed the project. 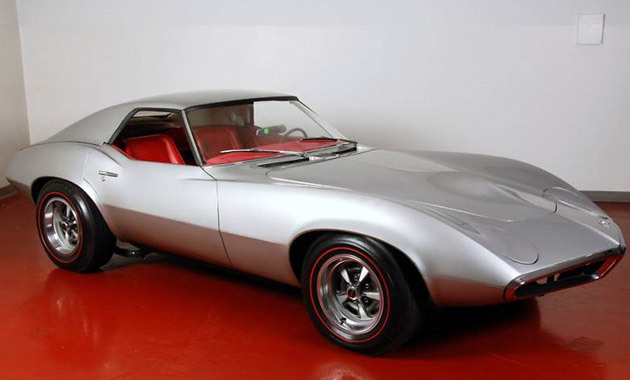 The 1964 XP-883 Pontiac Banshee I Concept was John DeLorean’s pet project and he wanted it in production. Two functional cars were designed by DeLorean’s design team and produced by an outside coachbuilder. 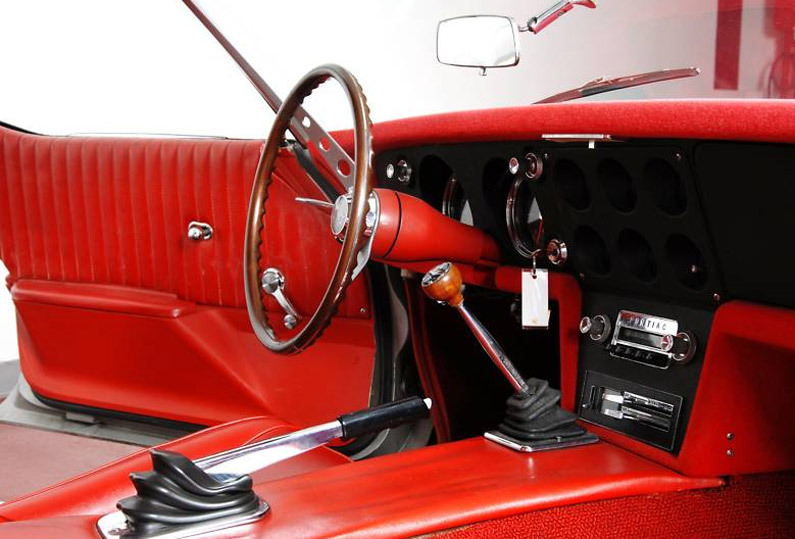 One was a two-passenger fiberglass coupe powered with a straight six-cylinder, overhead cam engine mated to a four-speed automatic transmission. It was painted Metallic Silver with a red interior and weighed approximately 2,200 pounds. The other vehicle was a pearlescent white, two-passenger roadster powered with a 326 C.I.D. V8 engine. 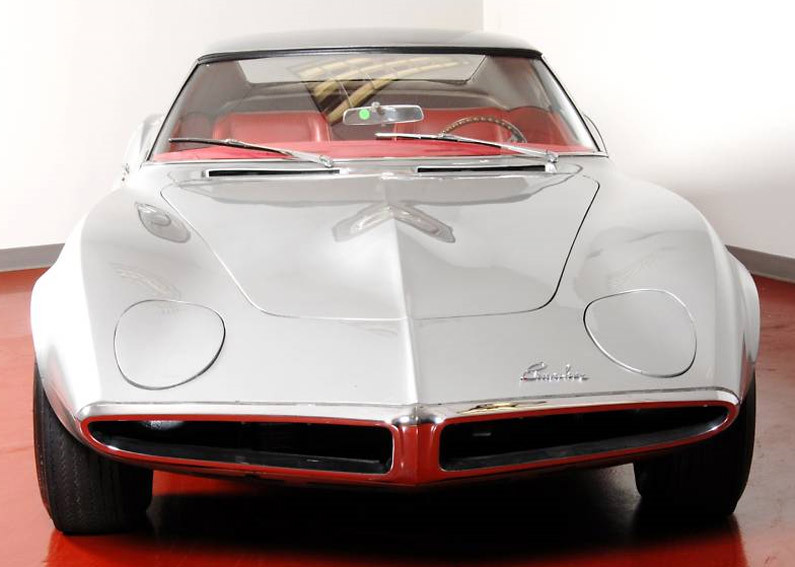 The third generation Corvette was already on the drawing boards at this time, and the Banshee borrowed styling cues from that car. A couple of things that distinguished the Banshee from the Corvette was that the Banshee used a solid rear axle, to keep costs down, and make the car more affordable than the Corvette and an unique clamshell door design. 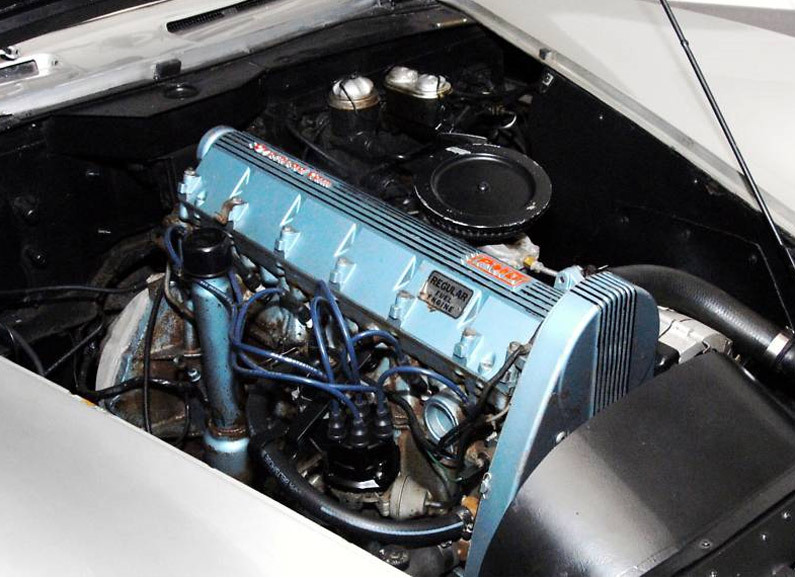 The one in my first post is the straight six and both were based of the Vette. Looks like a cross between a Vette and Opal. Interesting car. It's back up for round 3 or 4 or 5, I forget how many times it been offered. I wish this Pontiac would somehow end up in the new Pontiac Oakland Museum.